Like the slumbering world that missed Christ’s quiet birth in a Bethlehem stable 2000 years ago, many are sleeping during Advent, embracing “Christ-miss” rather than “Christ-Mass.” They miss the great miracle of Christ’s continued rule in the modern world; they miss the opportunity to draw closer to Christ and to experience His lasting peace and joy. Instead, in the deprived darkness of the modern secular “Christ-miss” world, people suffer in darkness, lost in the self-absorption of sinful addictions, lost in battles to promote sexual liberation, the killing of children and the control of the nation’s wealth, lost in transient relationships, broken marriages and the loneliness of going it alone. Into this broken world, the Light of Christ continues to shine brilliantly during Advent. Into a world that seeks to avoid the conception of children and to abort children, Jesus comes as a little child to establish a New Creation, a Creation of joyful life. Christ comes as a lowly and humble child to save men from their sins and to offer them lasting peace and joy by becoming children of God (John 1:12; CCC 526). Despite all the darkness and suffering in the world, there is Good News: Unto us a Child is born who is the Savior, Christ the Lord (cf. Luke 2:11). Is the One who is prophesized – “The coming of God’s Son to earth is an event of such immensity that God willed to prepare for it over centuries”(CCC 522). Through God’s beautiful Grace, prophets foretold of Christ’s coming (richly described in CCC 711-716), providing confirming proof to help mankind strengthen their faith through seeing prophecies fulfilled. Is welcomed by the Blessed Virgin Mother – God prepares a perfect womb for His Son to be born, interceding in nature through the Immaculate Conception of Mary, who is born without the stain of Original Sin (CCC 490-493), the first soul redeemed by Christ (even before His birth!). According to St. Augustine, Mary took a vow of virginity when she came of age. Mary was probably a young teen when the Angel Gabriel greets her, saying “Hail, full of Grace” (the only person in the bible to be so greeted) and “you have found favor with God” (Luke 1:26-37). 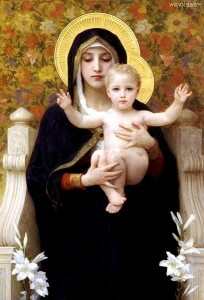 God, in His greatness, does not impose His Will on Mary, allowing Mary to give her blessed fiat (e.g. “let it be done”; Luke 1:38) that she gives enthusiastically (CCC 494). As the Virgin Mother realized 2000 years ago, “all nations will call me blessed” (Luke 1:48); today, her prophecy continues to be true around the world with each “Hail Mary”! Is accompanied by John the Baptist – John is conceived to the barren Elizabeth and the elderly priest Zechariah, pious Jews of OT Law, after the angel Gabriel announces the birth in the Temple Holy of Holies (Luke 1:5-24). John will be “filled with the Holy Spirit” and be a prophet in the spirit and power of Elijah foretold 400 years earlier (Mal 4:5-6). John will be a celibate and abstaining priest (like his father) and a prophet like Elijah who prepares the way for the Messiah (Luke 1:12-17). Is a miraculously conceived and born – Jesus is conceived, not from the dust of Adam but by the Father through the Holy Spirit who overshadows Mary (Luke 1:35), echoing the Spirit’s overshadowing the Temple in the OT (Ex 40:35), sanctifying her womb and making it fruitful (CCC 485). Fulfilling a 700 year old prophecy (Isa 7:14) Mary, the Virgin, not only conceives as a virgin, but mysteriously delivers the Child as a virgin, remaining perpetually a virgin (CCC 487-89). She becomes the “Mother of God” (Theotokos), Christ’s first disciple and “Mother of the Church” (CCC 495). The birth of Jesus is an exclusive miracle, never replicated. Is welcomed, protected and raised by Joseph – God underscores the importance of family and earthly fathers when He calls Joseph (Matt 1:18-25). Joseph protects Jesus and the Virgin Mother (Matt 2:13-15). Fulfilling the prophecy that the Messiah would be a descendent of King David (2 Sam 7), Joseph names the child and officially adopts Jesus at the time of His circumcision (Luke 2:21). Joseph, a pious and just Jew, raises Christ with the Virgin and teaches Him to be a carpenter (Mark 6:3). Overturns human assumptions about His birth – Jesus is expected to come as a King, born in an obviously royal household, with worldly power and might. Instead, Jesus is born in a third-rate town of Bethlehem where no prophets had yet been born (John 7:52; CCC 525), born in poverty. Angels participate in Christ’s Incarnation – Gabriel, not mentioned in the Bible since the prophesy of the Messiah to Daniel some 600 years earlier (Dan 9:24-27), returns to announce the Messiah to Zechariah (Luke 1:8-23) and Mary (Luke 1:26-38). A choir of angels come to the shepherds abiding in the fields (Luke 2:8-20). At Christ’s birth is an assembly of angels on earth rivaled only in Revelation. Inspires awe – Even in Elizabeth’s womb, moved by the Holy Spirit, John leaps for joy when he draws near Jesus in the New Ark of the Covenant (CCC 2676) and Elizabeth cries in a loud cry, “Blessed are you among women and blessed is the fruit of your womb (Luke 1:39-45). Perhaps drawn by ancient prophecy (Num 24:17-19), the Gentile Magi travel a great distance to offer the Christ Child gifts and to adore and worship Him (Matt 2:1-12). The shepherds, recalling the shepherd boy David, are called by an angel and rush to see the Christ and glorify and praise God (Luke 2:8-20). Simeon, moved by the Holy Spirit proclaims that the Child Jesus is the “light of revelation” and blesses the Holy Family (Luke 2:25-35). The prophetess Anna sees the Child and proclaims that He will be the redemption of Jerusalem (Luke 2:36-38). King Herod, awed into fright, fails to kill Jesus when he slaughters the Innocents (Matt 2:16-18), fulfilling a prophecy by Jeremiah (Jer 31:15), 600 years earlier. Remains fully present in the modern world – Jesus, the Savior Child born in Bethlehem (the House of Bread), ever present, offers Himself in the Eucharist of His Christ-Mass for those who choose not to miss Him.